Brats and beer are a great combination. Serve with German Potato Salad and in seasoned fruit for your next get together. Recipe adapted from Bruce Aidells’ Complete Sausage Book by Bruce Aidells and Denis Kelly, Ten Speed Press, 2000. Grill bratwurst over medium-hot fire, turning to brown evenly, until nicely browned and internal temperature reaches 160°F (70°C) on an instant-read meat thermometer. Remove from grill and add to skillet with onions. Over medium heat, cook and stir until sauce becomes syrupy. 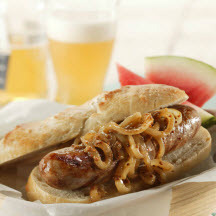 Serve bratwurst in rolls, generously smothered with the braised onions.